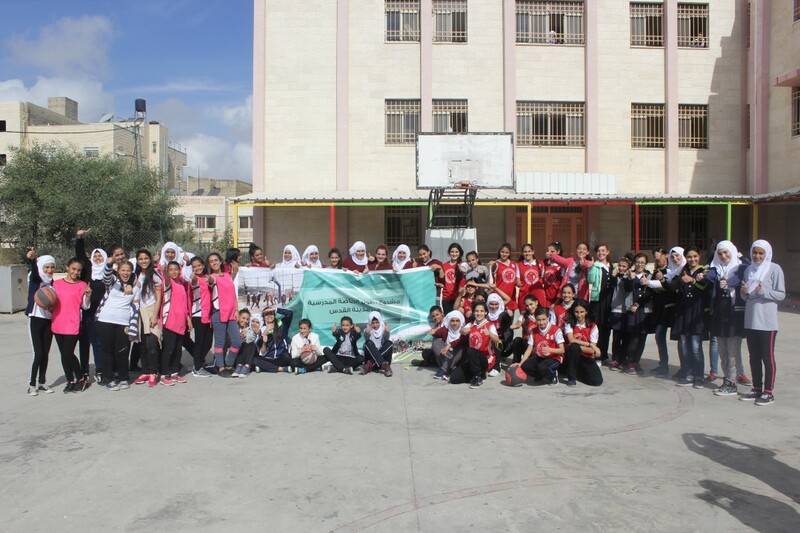 Burj Al-Luqluq Social Center Society and the Ministry of Education and Higher Education organized a basketball tournament for girls, on Wednesday 16th November 2016 at Riyad Al-Aqsa School – Al-Ram, within the Empowerment of School Sports project in Jerusalem. The tournament started with the participation of six schools which are the Rosary Sisters School, Al-Nizamiyeh High School, Riyad Al-Aqsa High School – Al-Dahiyeh, Riyad Al-Aqsa – Bethany, Al-Rawdah Al Haditheh and Al-Fatah High School. The supervisor of activities at the Ministry of Education and Higher Education, Mutaz Suan, attended the tournament alongside with the project coordinator, Ahmad Jaber, in addition to a number of physical education teachers. The tournament continued for four hours in which the Rosary Sisters School came first while Al-Nizamiyeh School came second after a very strong competition. At the end of the tournament, Ahmad Jaber and Mutaz Suan honoured the winning teams with cups and medals.